All Entries Tagged With: "rare metals"
Astronomers struck gold this week, in more ways than one. For the first time, LIGO scientists have caught two neutron stars in the act of colliding — revealing that these cosmic smashups are the source of heavy elements like gold and platinum. The discovery was made by the same pioneering team that won this year’s Nobel Prize for its discovery of gravitational waves, once theorized and predicted by Albert Einstein. 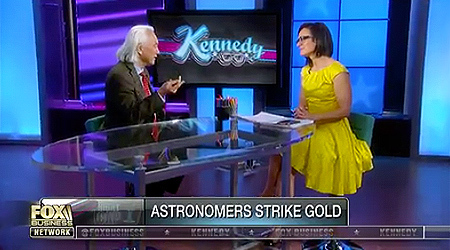 Famed futurist and theoretical physicist, Dr. Michio Kaku, joins Kennedy on FOX Business with more insights. WATCH NOW!